DESPITE all the technology being developed for agriculture these days, the fundamentals of farming have not changed – understanding variability is the key to making targeted decisions that save on input costs, increase productivity and better manage risk. For the full benefits of precision agriculture to be realised, it’s important to clearly identify the areas of production that most need attention. A range of tools can help hone in on these hotspots. One such tool is Decipher, a cloud-based, easy to use nutrition data management service that helps growers identify their land’s nutritional requirements before issues can be seen by the naked eye. Decipher business manager Wayne Hiller (pictured right) says the service assists with identifying areas of variability, supporting targeted sampling and tracking trends, month on month and year on year. “For instance, a grower may have been using the same units of phosphorous over a number of years, during that time achieving or exceeding yield targets and thinking everything is okay. The recently released Decipher Plus subscription provides customised nutrition data down to the individual paddock level. “You can set up your farm boundaries by uploading existing maps, or draw them yourself. This, along with historical 30m imagery and 10m high definition imagery, lets growers see what’s happening specific to those areas,” Wayne says. Detailed biomass imagery comparisons, generate easy to read charts measuring bulk soil density (g/cm3), giving greater insight into crop performance over time. “Growers can then start to investigate areas of interest by planning sampling jobs. Using the companion app DecipherGO, they can geolocate sample and observation sites for ease of identification at CSBP soil and plant lab, a Decipher partner laboratory. Decipher is a Wesfarmers business, evolving out of a deep understanding of agriculture and nutrition developed by Australian fertiliser and chemical company CSBP over more than 100 years. Variability during crop establishment can be caused by a range of factors, and it’s difficult to address early issues without a detailed picture of current and historical growth trends. 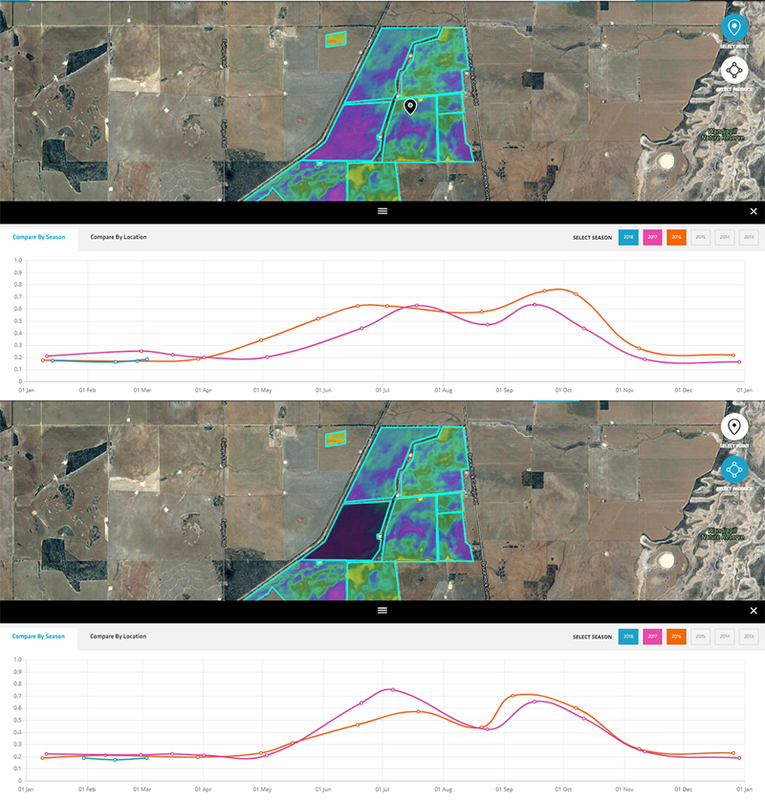 Decipher uses the Google Earth Engine to process mass amounts of imagery data in seconds, providing a visual analysis of paddock growth that makes it easier to spot and deal with variability. The detailed biomass imagery comparisons generate easy to read charts, giving greater insight into crop performance over time. The ability to quickly generate easy to understand charts and compare crop growth month on month means that problem areas are detected faster, giving farmers the information they need to make timely management decisions as the season progresses, and determine which management decisions are working and which aren’t. You can try Decipher for free or get started with Plus at decipher.com.au, or by downloading the app, DecipherGO.